Chef Roy Yamaguchi is a culinary pioneer known for founding Roy’s, a chain of popular Hawaiian fusion restaurants. The Nisei Week Foundation is proud to be celebrating the 75th anniversary of its Nisei Week Japanese Festival in 2015. The festival is an annual summer event with free cultural activities for all ages, including the must-see Grand Parade. The parade, part of the Nisei Week Festival’s first weekend of events, will make its way through the streets of Little Tokyo on Sunday, Aug. 16, starting at 5:30 p.m. (note time change). 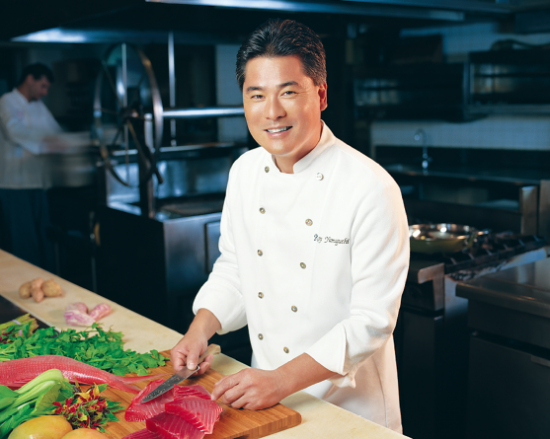 The parade will be led by the 2015 grand marshal, culinary chef Roy Yamaguchi of Roy’s Restaurants worldwide. The procession will start at Central Avenue and head east on Second Street, turning north on San Pedro Street, turning east on First Street, then turning south and ending on Central. This year, for the second time in L.A.’s history, the parade will feature a large, dramatic Nebuta float made of wood, special colored paper, and hundreds of LED lights and looks like a fierce, vibrant, samurai warrior. It was designed especially for the Nisei Week Festival, shipped from Japan and assembled here in the U.S.
Nebuta floats typically appear in Aomori’s annual Nebuta Festival, one of the largest and most popular parades in Japan. The Nebuta will be the grand finale of the parade as it is best viewed when dark. In addition, the parade will feature traditional Japanese ondo dancing, taiko drum performers, local community groups, elected officials and representatives from Nagoya, Los Angeles’ sister city, and the newly crowned 2015 Nisei Week Queen and Court. Yamaguchi is the chef and founder of a collection of restaurants including 30 Roy’s Restaurants in the U.S. and Guam, The Tavern by Roy Yamaguchi, and Eating House 1849. He is revered for his culinary skills and is an innovator of Hawaiian-inspired cuisine, an eclectic blend of California-French-Japanese cooking traditions created with fresh ingredients from Hawaii. He is the first from Hawaii to be recognized with the prestigious James Beard “Best Pacific Northwest Chef” Award in 1993 and earned numerous other honors, including California Chef of the Year (California Restaurant Writers Association), Gault-Millau Top 40 (Forbes FYI), Top 50 Cuisines in America (Conde Nast Traveler), Fine Dining Hall of Fame (Nation’s Restaurant News), and the John Heckathorn Dining Excellence Award (Honolulu Magazine). Yamaguchi was born and raised in Tokyo. His Hawaii roots are tied to his paternal grandfather, who owned a tavern in Wailuku, Maui in the 1940s. He attributes his appreciation for food to his Hawaii-born father and his Okinawa-born mother. Yamaguchi attended the Culinary Institute of America (CIA) in New York, where he received his formal culinary training. After graduating in 1976, he accepted positions at some of the most prestigious California restaurants at the time, L’Escoffier, L’Ermitage, Le Serene, Michael’s, and Le Gourmet in the Sheraton Plaza La Reina. In 1984, Yamaguchi opened his first restaurant, 385 North, in Hollywood, and in 1988, he moved to Honolulu to open the first Roy’s Restaurant. He is also credited as the mastermind behind the 1994 debut of Outback Steakhouse in Hawaii. Yamaguchi’s personal influence and community involvement have placed him among the most influential chefs in the nation. He gave the commencement speech to the 1996 graduating CIA class and in 2009 was elected to its Board of Trustees. In 2011, he was nominated by the late U.S. Sen. Daniel Inouye and earned a political appointment under the Obama Administration to the board of the Corporation for Travel Promotion, now known as Brand USA. He is one of 11 board members and has used his culinary and travel experience to help develop policies and strategies to promote the U.S. as a premier travel destination. He is also part of the U.S Department of State’s American Chef Corps, a network of chefs from across the U.S. who have agreed to be resources and elevate the role of culinary engagement in America’s formal and public diplomacy efforts. Yamaguchi founded and chairs, along with Chef Alan Wong, the Hawaii Food & Wine Festival, which has become Hawaii’s premier food and wine event. He established the Tom and Warren Matsuda Scholarship Fund, providing scholarships to attend the Culinary Institute of the Pacific, and more than 17 years ago founded the Roy’s Annual Golf Classic, which has raised more than $400,000 for Imua Family Service. Yamaguchi serves as trustee and/or member of many nonprofit boards, including U.S.-Japan Council, Go For Broke National Education Center, Culinary Institute of the Pacific, Hawaii Culinary Education Foundation, and Good to Grow. For more information, visit www.royyamaguchi.com. The 2015 Nisei Week Japanese Festival is a nine-day event first held in 1934, and is recognized today as one of the nation’s longest-running ethnic festivals. The festival will take place in Little Tokyo from Aug. 15 to 23. For a calendar of events, log on to www.NiseiWeek.org, call the Nisei Week Foundation office at (213) 687-7193 or email [email protected] The Nisei Week office is located at 244 S. San Pedro St., Suite 303, Los Angeles, CA 90012.